Timor-Leste’s long-awaited government must not leave the country’s youth out of its policy plans. Led by Mari Alkatiri, secretary-general of the Revolutionary Front for an Independent East Timor (Fretilin) for the second time as the prime minister, the Seventh Constitutional Government of Timor-Leste was finally sworn in on September 15. Some interesting figures were appointed in the new government, such as former president Jose Ramos-Horta, who was appointed as minister of state focusing on national security and defense, as well former rector of the National University of East Timor (UNTL) Aurelio Guterres, who was appointed foreign minister. The government was a long-time coming since parliamentary elections on July 22. After much negotiation, the new government composed of two coalition parties, Fretilin with 23 seats and the Democratic Party (PD) with seven seats in the 65-seat house. This minority government hopes to maintain stability and ensure peace. Alkatiri said the new government will be characterized by political inclusion and vowed to improve the lives of the Timorese people with efforts to reduce uneven development between city and rural areas, and fighting against corruption. The earlier agreement on between Fretilin, PD and Kmanek Haburas Unidade Nasional Timor Oan (Khunto) fell apart when the youth party withdrew from the coalition at the last minute. It was also reported that they could not reach agreement in compromising the principle of proportionality that had earlier been agreed between the three parties. The National Congress for Timorese Reconstruction (CNRT) under the leadership of former revolutionary leader, Xanana Gusmao, together with the immediate ex-president Taur Matan Ruak’s Popular Liberation Party (PLP) emphasized that it would support the new government. 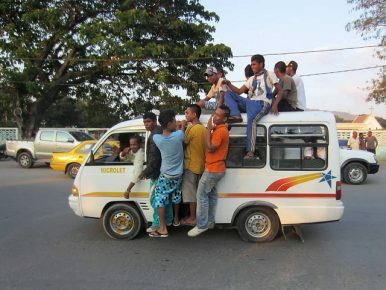 According to World Bank, about 60 percent of Timor-Leste’s 1.2 million people are under 25-years-old. Speaking to youths about their views on the new cabinet and if they think Timor-Leste is moving in the right direction, living up to the democratic values politicians are always prattling on about, there appears to be a mixture of reactions. Generally they seem to either be neutral or supportive. Regardless, most felt that the new government should continue to focus on areas of basic need: quality education, clean water, health and infrastructure facilities. Leoneto Elizario, working for the Secretariat of State for Vocational Training, Policy and Employment (SEPFOPE) thinks Timor-Leste is moving in a positive direction, the peaceful elections a measure of success. For Leoneto, the fact that Alkatiri, who is Muslim, is now prime minister of a predominantly Roman Catholic country, is a strong indication of how Timorese value their differences. Leoneto hopes that the new cabinet can focus on public administration reform, health, education, and job creation. Miqueias Mendonca Tilma, a student at the Dili Institute of Technology (DIT), remains hopeful, despite the political uncertainty inherent in a minority government, that the new government can generate more opportunities for the unemployed youth. As for Marcos Pinto, who is currently working in the natural resources sector, the new government’s lineup is ambitious and that could be a good thing. He supports whomever runs the government, hoping it can continue to provide security and safeguard the interests of the people — rather than engage in power struggles. He also hopes the government will focus on education, agriculture and infrastructure. For him, these areas are crucial to overcome problems such as food security. Fernando A.T. Ximenes, a final-year student from the National University of East Timor (UNTL) thinks the long negotiation process to form the government proves that generational transition remains an unfinished task. Despite several new faces, the cabinet is led and filled with elders and dominant institutional figures. He does not think the new cabinet will dramatically change the country’s current economic development pattern. While some critics have expressed concern over the sustainability of the minority government, the surprising electoral results for Khunto, a youth party focused mainly on issues like unemployment and the support for the government from the newly formed PLP, which also has a large youth contingent, is indicative of the growing role of Timorese youth in politics. Youths will shape a crucial part of Timor-Leste’s development, and their role is indispensable. This is something the new government should recognize, and it should take measures to address the issues which most concern the country’s youth. The youth should not be left out of the progress that Alkatiri, and his government, hope to achieve. Khoo Ying Hooi, Ph.D., is Senior Lecturer at the Department of International and Strategic Studies, Faculty of Arts and Social Sciences, University of Malaya. A New Era of Political Coalitions in Timor-Leste?Facebook: Strengthening Timor-Leste’s DemocracyTimor-Leste Finally Has a Government. Now What?Timor-Leste: A Nation Waiting for a GovernmentCan Timor-Leste’s Next Government Pursue Much-Needed Budget Cuts?